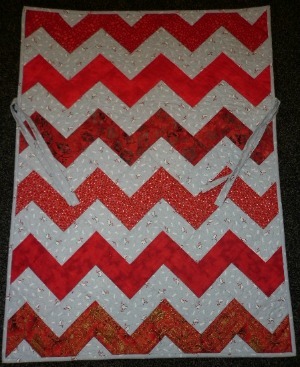 This chevron baby quilt is only 26" x 32" in size and consequently very quick to make up. I'd just finished my first baby car seat quilt for my daughters baby and decided I should make another one for my nieces new baby. I have always loved the chevron design and decided this was the perfect opportunity to try this. I had an ever increasing number of red fabrics in my stash so decided this was going to be one of the main colors. I love the lovely solid grey fabrics currently on the market and was off to buy some for this quilt. While shopping my daughter came across this very cute wee bird fabric (shown in the quilt) with red birds on a grey background and told me it was a much cuter choice for a baby quilt. She was so right! 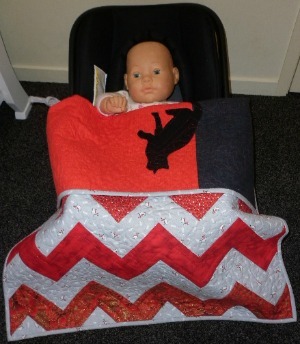 Fortunately I came across AmandaJean of Crazy Mom Quilts tutorial for making a chevron quilt the very next day! Unfortunately this tutorial is no longer available but I have added an alternative below. I had initially intended to make mine using the half square triangle method. Amanda's method was so simple to make. Arranging my blocks was a slight mind challenge as they are all placed on point. You definitely need a flat surface to lay this out on. Thank goodness Amanda's tutorial was great to follow - complete with photos! Another tutorial I found on the web that uses the same method as Amanda's comes from The Little Fabric Blog. Again I decided to use flannel on the back. As this is a more contemporary quilt I used two colors (red & black). I then decided it needed some interest. I had a spare black cat ( from my Nightime Cat Antics quilt) applique that I'd made the wrong size. Due to the long tail on the cat I placed it facing the baby - not the ideal according to my daughter. She thought it would have looked better facing the right way up for everyone else to see. I have placed the pattern for this wee quilt here. Sorry no cat template though. I used google images to find a cat image I liked. I hope my niece likes this quilt!